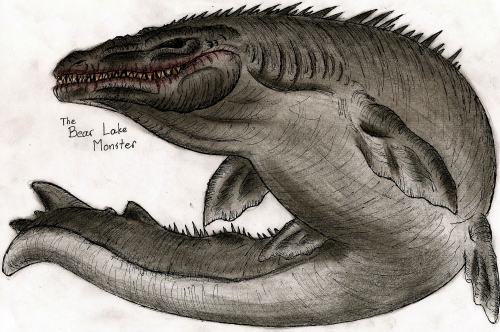 The Bear Lake monster, a combination of dragon, bear, and fish, 'measuring twenty feet in length and possessing the roar of a lion is again agitating tho people over the mountains. According' to the Republican's informant this monster made its appearance on the lake front a few nights ago and killed a horse tied near a campfire. The owners Messrs. T. R. Mooney and Fred Horne, firing a number of shots at the peculiar looking dragon without effective results. We camped on the eastern shore of Bear Lake just after sundown. After getting our horses tied to a large tree near the water’s edge, and fed, we started to prepare our supper. My partner, Mr. Horne, called my attention to something out in the lake about a half mile. As we watched, it would sink into the water for a second then out again. The lake being perfectly calm we couldn’t account for the strange object, but it came nearer to us and still going down and out of the water. Had it not been for this we would have thought it a gasoline launch or some other vessel. It was now close enough for us to see that it was some water monster. We grabbed our 30-30 rifles and each of us fired at it, but could not see that we hit him, although he turned slightly to the south. Before we had time to fire again he turned towards us. Our horses were now very frightened, one of which broke loose. We stepped back into the trees a few feet and both fired, and my God, for the growl that beast let, then started towards us like a mad elephant. We ran up the hillside a few rods to a cliff of rocks and then began to shoot as rapidly as possible. With every shot he seemed to get more strength and growl more devilish. The animal was now so close to shore that we couldn’t see it for the trees. We thought of our horse that was tied to the tree and after reloading our guns we ran down to protect him if possible. Just as we reached our campfire, which was blazing up pretty well, we could see that ugly monster raise his front paw and strike the horse to the ground. Then he turned and started for deep water. In our excitement we began to pour lead at him again, and then with a terrific growl made a terrible swish in the water and sprang toward us. Before we could move he grabbed the horse with his two front paws, opened its monstrous mouth and crashed its teeth into it like a bull terrier would a mouse. After tearing the horse badly he made an awful howl and then was gone, plowing through the water. But the sight I’ll never forget. It seemed to be all head, two large staring eyes as large as a front wagon wheel, nose and mouth like a great large fish. Its arms seemed to come out on either side of its head where the ears naturally would be. The hind legs were long’ and bent like that of the kangaroo. Then the hind end was like the tip end of a monster fish. We walked to a ranch up the shore, a quarter of a mile and staid till morning. When we went back in the morning we found the animal had come back again in the night and carried the dead horse off. He also broke off trees four and five inches through. Also tore largo holes in the beach, and its tracks were like those of a bear, but measuring three feet long and nearly two feet wide. We could not tell if our bullets would go through his hide or not, but noticed some of them would glance off and hum like they had struck one of his teeth, which always seemed to show. As there was so much blood from the mangled horse, we could not tell whether the beast of the lake was bleeding. nameless monsters. The story is a curious one. Someone variety of amphibious animals supposed to be extinct may have survived in Bear or Saguache. Without announcing our full belief of the story, we may remark its prevalence is hard to account for, unless it has some foundation in fact.